Did you know that grasslands occupy 25% of Earth’s surface and moreover it is home to the world’s fastest animal-cheetah, largest terrestrial animal-African bush elephant, largest bird-ostrich and heaviest snake-green anaconda? Grasslands animals can be found in all the continents except Antarctica. Here is a very brief list of characteristics and introduction of grassland animals. It is distinguished by it’s long, narrow neck and red, white fur. It is one the rarest and Africa’s endangered carnivore. They have a flat skull. The ears are broad, pointed and directly forward. Males are larger than females by 20% more body mass. They have short guard hairs and thick underfur which help them fight temperatures as low as -15°C. They are social animals living in a pair of 6 more commonly. They never sleep in dens, they use it only for nursing pups. The mating season is between August and November. Kangaroos are indigenous to Australia. These have large powerful hind legs for leaping, a long muscular tail for balance and a small head. 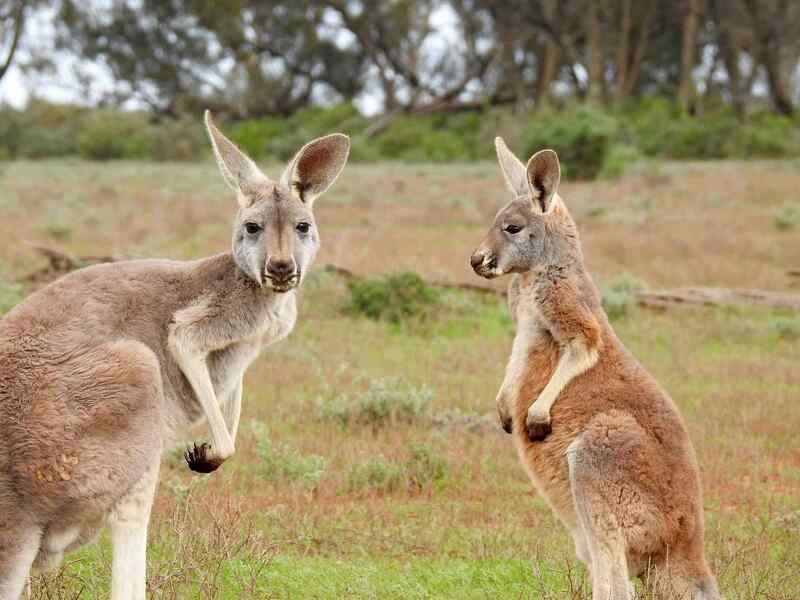 Female kangaroos have pouches called a marsupium in which joeys (young ones of kangaroos) end their postnatal development. They are adept swimmers and often flee into waterways when threatened. The lifespan of kangaroos averages for 6 years in the wild to in excess of 20 years in captivity. It is one of the most famous Australian animals in the world. One of the grassland animals in the world, Pronghorns have distinct white fur. Their body temperature is the same as humans i.e. 38°C (100°F). Females have smaller horns than males and sometimes are barely visible. Pronghorns have a distinct and musky odour. Males mark their territory with a preorbital scent gland which is on the sides of their hand. They also have very large eyes with 320° field of vision. It is often cited as the second fastest animal after cheetah. It can, however, sustain it’s high speeds longer than a cheetah. They are spread across from South of Ethiopia to as far as South of Botswana and eastern South Africa. They are highly social species forming harems with a single stallion. These animals keep a watch for their predators rather than hiding. They bark or snort when they see a predator and then hunt them. Males may weigh 10% more than females. They are North and South American mammals. These are known for their ability to spray a liquid with an unpleasant smell. The most common colour of their fur is black and white while some have brown or grey. All the skunks are stripped from their birth itself. They are omnivores and they change their diet according to the seasonal variations. Yet they have very good senses of smelling and hearing, they have very poor sight of vision i.e. they are unable to see objects more than 3km away. This makes them vulnerable to the road traffic. This species is spread across South, North and East Africa and a few places in Iran. It is declared as vulnerable by IUCN Red list due to poaching, illicit pet trade, human conflicts, and deforestation. As we all know, it is the fastest land animal. It has a small rounded neck, spotted fur, long spotted tail and long thin legs. Although taller than a leopard, it is smaller than a lion. They are mainly active during the day with hunting as their major bustle. Cheetahs are diurnal while lions and leopards are nocturnal (active during the night). They are spread across Bolivia, Paraguay, Brazil, and Argentina. The adult males are black whereas the females and their babies are a bit yellowish. They sleep or rest for over 70% of the day. This makes them least active monkeys of the world. Their average lifespan is 15 years. Their limb structure makes them awkward with their movement, therefore they spend most of their time in trees and comes down only during the dry spells. Otherwise, they lick water from the moist leaves by wetting their hands on it. These are one of the few species in America. They have blue or blue, rose plumage. Females have less bright colours than the males but there no noticeable difference between the two. Its predators include snakes, rats, and racoons. They are voracious insect consumers making any gardeners free from insects. Therefore, gardeners always try to attract bluebirds in the region where they are found. They are salamanders and are found in North America, North Africa, Europe, and Asia. They are semiaquatic, alternating between terrestrial and aquatic habitats during the course of the year. These are also threatened by human activities. They have semipermeable granular skin, four equal sized limbs and a distinct tail. Many of them produce toxins from their skin as a result for their defence mechanism. It is illegal to disturb or handle some newts in the UK without a license. They often feed on animals and plant debris and decompose them and eat other animal invertebrates. Many beetles are aposematic, with their bright colours warning for their toxicity. Their predators include bats, rodents, lizards, dragonfly, ants, spiders etc. They are very prominent in human culture and one of the strongest animals in the world. They have many uses from ancient Egyptian culture to its use in technologies. They are even used as cyborgs. These are lizards having no pronounced neck with small limbs. Some of them have no limbs at all. They have green coloured blood. They have long tapered tail which sheds off when predators catch them. Such species can regenerate their tails though imperfectly. They prey on insects like grasshoppers, beetles, flies, crickets, caterpillars, etc. It also includes worms, millipedes, snails, slugs, isopods, etc. The hartebeest is an African antelope and one of the most beautiful grassland animals in the world. It weighs 100-200kg and is over 1m in height at it’s the shoulder. It has an elongated forehead, long neck, oddly shaped horns, and inaccurately long legs. The coat colour depends on the subspecies and varies from sandy to chocolate brown colour. They are very alert and non-aggressive. They primarily feed on grass and hence one of the amazing grassland animals in the world. This rodent is native to North America. It has a long and multicoloured tail. They are most commonly used for experimental purposes due to their hygiene and easy-care. They are very tiny about 3-4 inches not including the tail. They have round beady eyes and broad ears giving them a good sense of sight and hearing. These are nocturnal animals which spend their daytime in their burrows. Their pups/ litters are born altricial( born blind) and naked. They get their coats within 2 weeks after the birth. It is one of the most unique grassland animals in the world. It is a large, gregarious carnivore and native to South America. Although these are peaceful, sometimes aggression has been observed. This mammal is diurnal. The species was declared endangered in 1999 and its population is estimated to be below 5000. It preys on snakes, fishes, crabs, turtles, etc. It is an amphibian and therefore it lives near rivers. One of the grassland animals in the world is native to South America. These are kept in herds that graze at heights. Its fibre is used in making knitted and woven clothes similar to a sheep’s wool. They communicate through body language, e.g. they spit when they show fear, dominance, or distress nature. Male alpacas show more dominant than females in the herd. These are the grassland animals in the world. Do post your comments.